Treat yourself or the people on your gift list to the taste of New England when you buy seafood online from Lobster Anywhere seafood catalogs featuring fresh seafood for baked or grilled lobster anytime, anywhere! Get Free Chowder on your first order of $75 or more. Use Coupon Code NECatalogs at checkout on the LobsterAnywhere.com website. Live Maine lobster for a grilled lobster dinner - Lobster Anywhere is the specialist in fresh overnight lobster delivery. Your hard-shelled one and half pound to three pound fresh Maine lobster will arrive chilled and packed in seawater ready to cook for a tasty grilled lobster dinner! Cooked lobster - Whether you choose fresh cooked and shelled or frozen lobster tails perfect for grilled lobster meals, you will enjoy the sweet taste of fresh cooked lobster tail when you dip the tender meat in butter, add it to salads, or use it in your favorite lobster recipe. Grilled Lobster and Shellfish - Besides succulent baked or grilled lobster, feast your eyes on tender, rich sea scallops, fresh mussels and Maine steamers --- when you buy seafood online from Lobster Anywhere, you'll enjoy the mouthwatering taste of New England's most famous foods no matter where you live. Cooked lobster specialties - Compliment those grilled lobster dinners with other Down East creations when you buy clam chowder or lobster bisque online from their collection of authentic Maine recipes. Or choose the seasonal lobster pie, loaded with rich and sweet lobster meat and topped with a crown of buttery crumb crust. When you order seafood online from Lobster Anywhere, you will enjoy the freshest tastes of New England in each and every bite. Largest Lobster dinners online - What could be better than receiving a classic New England meal, complete with cooked lobster and all the extras like chowder, crackers, and either Harbor Sweets chocolates or fine cigars? Or order the perfect combination of steak and seafood online when you choose a juicy filet mignon with the largest lobster selections. Each meal comes with steel claw-crackers, forks, cheerful checkered napkins and of course, authentic lobster bibs! The perfect holiday gifts - When you're looking for exceptional food choices for Christmas gifts, Lobster Anywhere seafood catalogs is the place to start with a selection of fresh seafood online. From fresh lobster delivery to chowders and complete Down East meals, each and every item on their menu is a taste of New England goodness! When you buy seafood online, make sure it's the best. Whether you're preparing grilled lobster, broiled or baked, enjoy uncooked or cooked lobster, small lobsters or the largest lobsters jumbo sized and weighing in at three lbs! 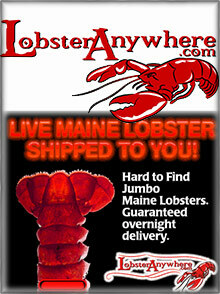 From the ocean to your door overnight --- that's Lobster Anywhere.